The University of Georgia was well represented at this year’s Georgia Bio Awards, with three awards recognizing people and programs either at or affiliated with the university. The awards were presented by Georgia Bio, the association for Georgia’s life sciences industry, at its 2019 annual awards dinner, held Feb. 8 in Atlanta. Georgia Bio members include pharmaceutical, biotechnology and medical device companies; medical centers; universities and research institutes; government groups; and other business organizations involved in the development of life sciences-related products and services. 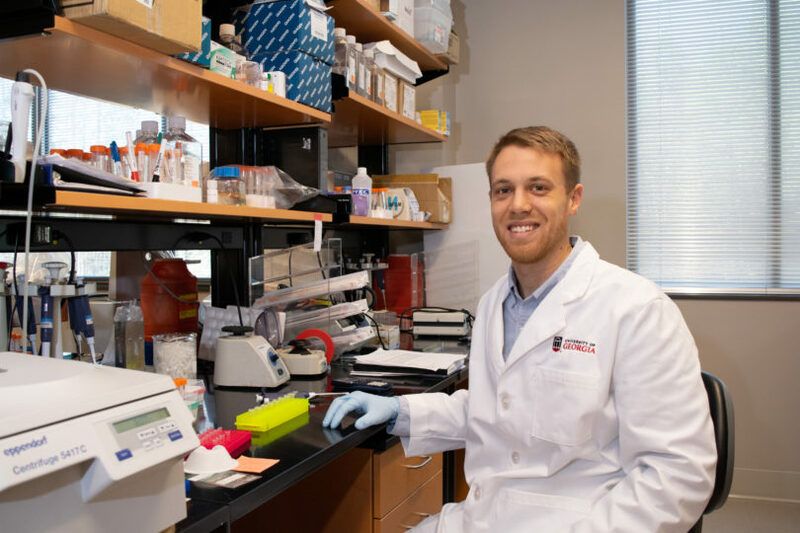 This year, awards were presented to the International Biomedical Regulatory Sciences Program at the UGA College of Pharmacy and Benjamin Boward, a Ph.D. student in biochemistry and molecular biology at the Franklin College of Arts and Sciences. Another winner, Boehringer Ingelheim Animal Health USA Inc., is a longtime industry partner of UGA. UGA professor Michael Bartlett accepted a Community Award presented to the International Biomedical Regulatory Sciences Program at the university’s College of Pharmacy. The program provides specialized ­education in the scientific and technical approaches needed to gain approval for new products, as well as maintaining existing products on the market. The program is global in scale and covers both domestic and international regulations across a range of biomedical products. The award was one of six presented to individuals, companies or institutions whose contributions to Georgia’s life sciences community are worthy of special recognition. Boward accepted an Emerging Leader of the Year Award, presented to young individuals who have made a significant impact on the life sciences industry through their studies or employment. Boward studies stem cell biology, specifically the genetic regulation of embryonic kidney development, with Stephen Dalton, Georgia Research Alliance Eminent Scholar of Molecular Biology and director of UGA’s Center for Molecular Medicine. Boward has been extensively involved in the entrepreneurship and technology transfer community in Athens, serving as the entrepreneurial lead for the InfraredRx Inc. team in the first NSF I-Corps cohort at UGA, as an intern in UGA’s Innovation Gateway, and as co-manager of due diligence for the BioMed Investor Network. He is the UGA liaison for the Emerging Leaders Network and volunteers with events like the Georgia BioEd Institute Golf Outing and the Georgia Bio Annual Summit. After graduating, he will join a biotechnology company in Boston to work on developing diagnostic assays for cancer detection. Boehringer Ingelheim received a Deal of the Year Award for economic development for investments in Georgia facilities. The award is presented to companies for the most significant financial or commercial transactions based on importance to Georgia’s life sciences industry. Boehringer Ingelheim and UGA have worked together for more than three decades, spanning more than 100 formal collaborations ranging from the exchange of materials to license agreements that have seen university innovations become commercial products. The partnership was recognized in 2014 by Georgia Bio, when Boehringer Ingelheim—then known as Merial—and UGA received a Phoenix Award recognizing honorees who forged academic and industry relationships that drive translation and lead to new treatments and cures.